each, performed in front of the architecture featured. 1. Pillar and 5 Dancers. Homage to William Kent. 2. Front of Chiswick House. Homage to Lord Burlington, ‘Apollo of the Arts’. 3. Gate and 6 Dancers. Homage to Inigo Jones. 4. Temple and 7 Dancers. compositions of the architectural sites selected. principal dancer and choreographer, Dane Hurst. Richard Boyle, 3rd Earl of Burlington (1694-1753), known from Horace Walpole's epithet as the ‘Apollo of the arts'. completed his suburban dream at Chiswick in 1729. Four years later he moved his great art collection there from Burlington House, Piccadilly (today the home of the Royal Academy of Arts). The house is now owned and opened to the public by English Heritage. Since 1989 Martin has been artist-in-residence with his own studio and study in the gate-lodge. This compact hideaway was built in 1835 to the designs of the architect Decimus Burton, who is best known today as the architect of Wellington Arch at Hyde Park Corner. 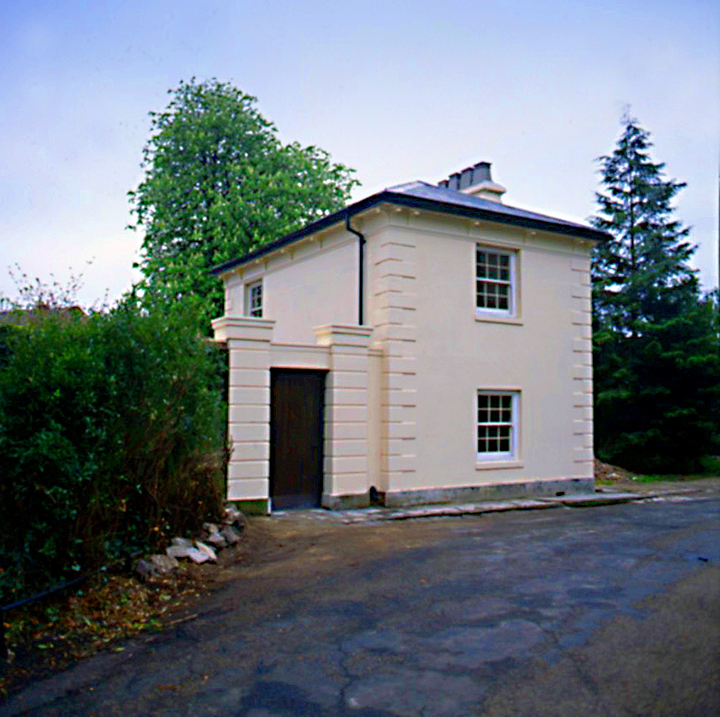 Martin's lodge was built for Chiswick's later owner, the 6th Duke of Devonshire. With his studio in the park, Martin is free to roam after closing time, with 40 acres to himself, drawing and reflecting on his creative forbears. Martin spotted the Duke of Devonshire's gate-lodge when it was close to death. The sad hulk had been abandoned for 25 years, except by vandals and tramps who had stripped out all the floors, joists and lathes to make fires. The gatekeeper's walled garden and outbuildings were indistinguishable, strewn with rubbish and filled with wind-sown sycamore trees stretching over 30 feet tall. After securing a long lease on the ruin he enlisted the expertise of an architect friend, Theo Crosby of the Pentagram group, who designed a new interior worthy of the grade 2 listed building. Preliminary archaeology revealed an Elizabethan well and trough that must have served thirsty travellers and their steeds on the old west road out of London en route to Bath. It felt like a promising find for a new artist's studio, perhaps, even, a sign.